Derrick Gordon Kingman Turquoise Bracelet size 6 3/8"
This split-cuff bracelet by Navajo silversmith Derrick Gordon is set with an egg-shaped stone of natural, untreated Kingman turquoise from Arizona. This tight-grained turquoise is polished to glassy smothness and shows tightly webbed pattern throughout the stone. 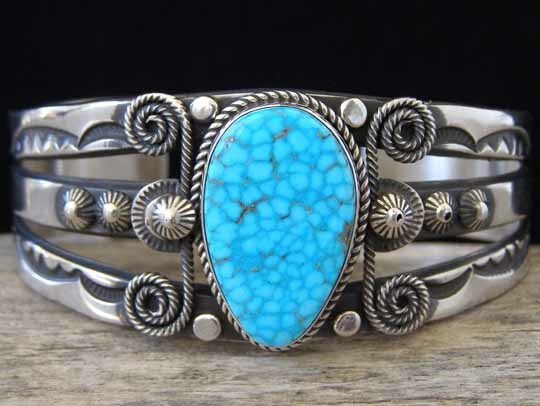 Such Kingman turquoise is often referred to as "water web" stone. The stone is set in a smooth bezel wrapped with twist wire and framed by starred buttons and twisted square wire scrollwork. Width of cuff at terminals: 5/8"